The Philips Avent Classic+ Newborn Starter set has everything you need to start bottle feeding a newborn, whether feeding exclusively with bottle or combining breast and bottle. The set includes 2 x 125-ml bottles with newborn-flow teats, 2 x 260ml bottles with slow-flow teats, plus a bottle & teat brush, and a newborn soother.Since 1984, the Classic bottle has been used and trusted by mums to prevent colic and keep their baby’s happy when feeding. Thirty years on and the Classic bottle has been revinvented. Introducing the Philips Avent Classic+ Anti-Colic feeding bottles. The advanced two piece anti-colic system helps your baby to control milk similarly to when being breastfed, making Classic+ easy to use when combining both bottle and breastfeeding. The Philips Avent Classic+ Newborn Starter set has everything you need to start feeding a newborn, whether feeding exclusively with a bottle or combining breast and bottle. The set includes 3 x 125 ml bottles with newborn-flow teats, 2 x 260 ml bottles with slowflow teats, plus a bottle and teat brush, and a newborn soother. Since 1984, the Classic bottle has been used and trusted by mums to prevent colic and keep their babies happy when feeding. Thirty years on and the Classic bottle has been reinvented. Philips Avent Classic+ has an anti-colic valve on the teat, which opens to allow air into the bottle instead of your baby’s tummy and flexes to your baby’s feeding rhythm, minimising overeating, gas and spit-up. This anti-colic system is integrated into the teat, making the bottle easier to assemble and clean. All Philips Avent bottles and teats have been proudly made in the UK since 1984 and are designed with both baby and parent in mind. Through extensive research and clinical trials, Philips Avent products promote baby’s wellbeing and growth. 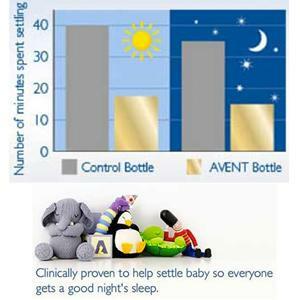 Philips Avent is delighted to be the No. 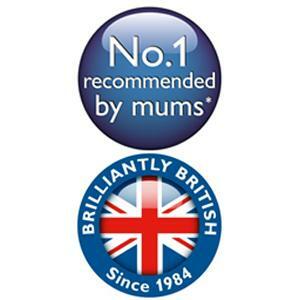 1 recommended brand by UK Mums* with its products loved by Mums and Babies across the UK. *Based on December 2011 TNS online satisfaction survey conducted among more than 36,000 female users of childcare brands and products worldwide. Feeding bottles, no matter what size or shape, need air to replace the milk your baby consumes. When your baby drinks, a vacuum is formed in the bottle restricting the milk flow, causing frustration and more vigorous sucking, this leads to the baby taking in air. Most bottles overcome this problem by drawing air in via a small hole located on top of the teat- but this can interrupt the baby’s natural flow and sucking rhythm. Because the Classic+ system is integrated into the teat, the risk of colic and fussing is reduced for a comfortable feeding experience. Unsettled and irritable behaviour, known as fussing, is by far the most commonly known crying behaviour in babies. Clinical studies that the Philips Avent Classic+ bottle significantly reduces fussing by approximately 28 minutes a day as compared to a comparator bottle. This was especially true during night-time. Fussing: A clinical study showed that at two weeks of age, babies showed less fussing than babies fed with another leading bottle. Colic: A clinical study showed that at two weeks of age babies fed with a Philips Avent bottle showed a trend to less colic than babies fed with a conventional bottle.